Winter turns us into wimps, we move 25% less. Nike was tired of that, and wanted to win winter. So they came to us before the holiday season with two problems: First, how do we get people to stop using the elements as an excuse? 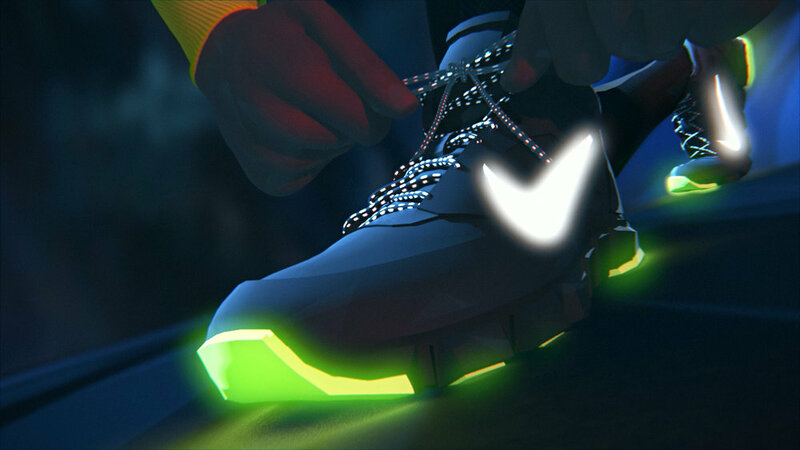 And secondly, they were looking for a way to integrate the NikeFuel currency into the campaign for both market awareness and to engage early adopters. So, how do you get people to give up warmth and comfort and take on winter? You turn working out into a game, where your movement in the physical world is mirrored in a virtual world. We created the first-of-its-kind, NikeFuel Missions — an interactive campaign powered by your everyday movements. Survivors had one mission: to find their way to the only safe place left on earth — the eye of the storm, Nike’s way of inspiring people to run towards their biggest challenges, not away from them. In the story, Nike+ users battle through four, unique levels joined by their favorite Nike athletes Calvin Johnson, Alex Morgan, Allison Felix and Neymar, Jr.
NikeFuel Missions proved to deliver on both campaign goals. In the first 3 months it drove 50k new member sign-ups to Nike+ every month. It also engaged over 100,000 current Nike+ members to take on winter and get moving. Adding intangible value and exclusivity to the Nike+ community. It was an extremely successful integrated campaign boosting support for the Nike+ FuelBand, Nike+ Membership, and the Winter line of cold-weather products. It engaged users daily, motivating them to keep moving and never let winter get in the way again.